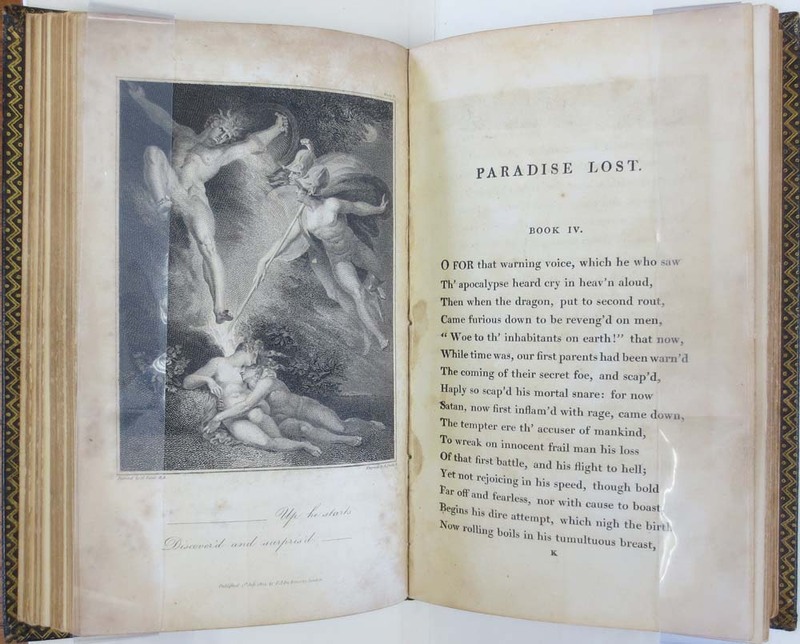 Milton's Paradise Lost : A New Edition. London: Printed by T. Bensley, Bolt Court, Fleet Street for F.J. Du Roveray, 1802. 2 Volumes. Swiss-born Henry Fuseli, the illustrator of this edition emigrated to England in 1765 and held a life-long fascination with both William Shakespeare and John Milton. Fuseli worked for many years piecing together illustration jobs until he saw Alderman Boydell's Shakespeare Gallery, a large scale exhibition of illustrative art from Shakespeare's plays. Fuseli immediately began working towards a similar exhibition for Milton by single-handedly producing over 40 paintings illustrating Milton's poetry. He opened his Milton Gallery in 1799, however the venture was a financial failure and closed shortly thereafter. Many of these illustrations, appearing in 1802, are based on the larger paintings for his Milton Gallery. Despite the financial failure of the Milton Gallery, his effort was recognized by his election to the Royal Academy as Professor of Painting.